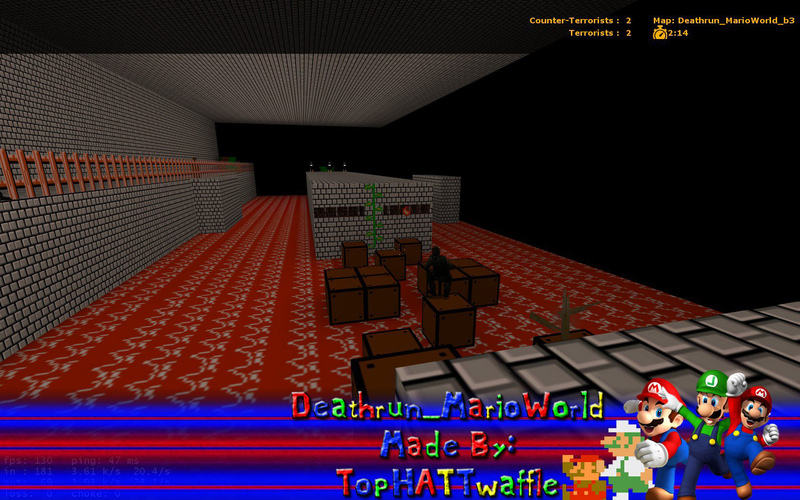 Play you favorite classic Nintendo game in Deathrun Form. Run, jump, and knife your way to the end flag, then kill the one who tried to kill you! 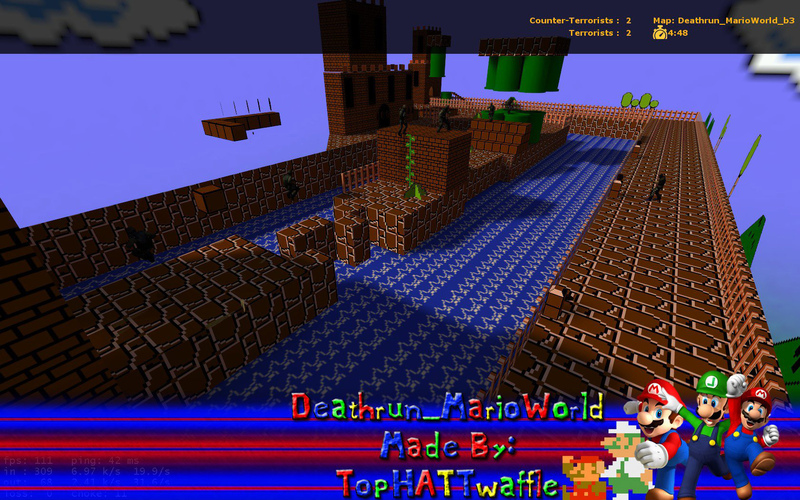 this map is 100% custom textures, made by me and unho1y. models (From a unknown provider). 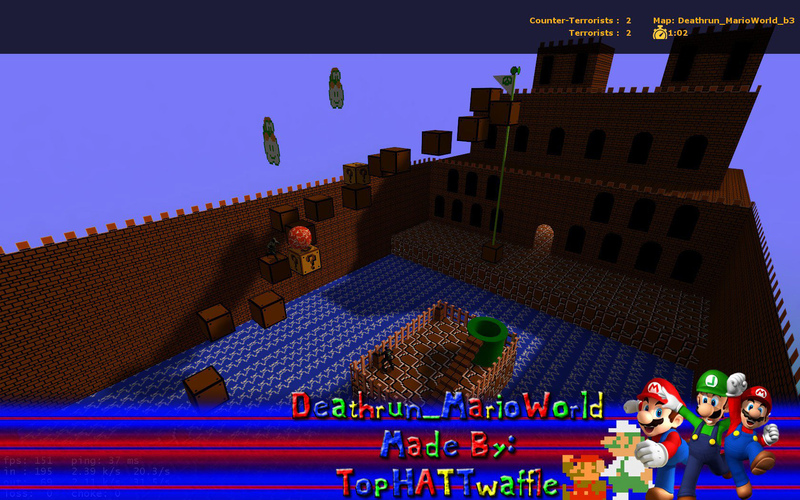 Features: Custom textures (Total of 65) Custom Models 20 traps, all made to kill 3 secret coins to wear 4 end games (they are NOT just the normal “Bhop, Awp, Knife) 1 secret ending, STARRING: Bowser fun Easter eggs 16 Custom sounds from mario Trap list: Trap 1: Breaking floor, this trap is a 4x5 set of blocks the will beak at random each time. you can always jump the gap. Trap 2: Giant Goomba, a giant goomba show up to crush you into the wall! Trap 3: Pipe Piranha, Pipe Piranhas come out from their hiding spot to kill you Trap 4: “?” blocks of death, “?” block spawn and try to push you off the path Trap 5: Coins barrage, you get sucked into a pipe and shot with a deadly barrage of coins Trap 6: Koopa Troopas, blocks fall from the roof to crush the koopa’s, and send their shells flying at you. Trap 7: Bullet Bills, Bullet bill shows you what hes made of Trap 8: 3 sets of 2, goombs found their way into the “?” block, and they want to kill you Trap 9: Fire, standard fire trap Trap 10: Fail Boo Box, You get trapped in boo’s box of death, then he comes to kill you! Trap 11: Lowering Platform, the platforms lower you to your death Trap 12: Wobbly platform, the platform is not sturdy, walk on at your own risk! Trap 13: Bowser Bridge, The bridge break bowser style Trap 14: Fire ropes, dot get hit! they burn! Trap 15: Fire ropes, dot get hit! they burn! Trap 16: Fire ball launcher, fire balls get shot at you, they hurt! Trap 17: Hammer Bros., they come out to show you their hammers, in your face Trap 18: Bob-Ombs, They go boom, they make you dead! 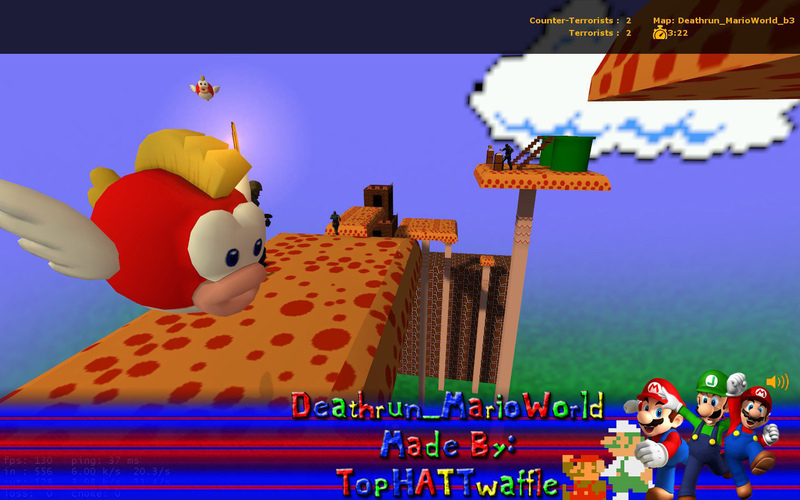 NEWTrap 19: Chain Chomp, The chain chomp has broken from his chain and wants BLOOD Trap 20: Cloud Guy, Cloud guys throw their balls at you Trap 21: Cloud Guy, Cloud guys throw their balls at you MiniGame 1 Rules: stand on the stool on the shell launcher and left click to shoot shells before the T’s get to you and kill you! 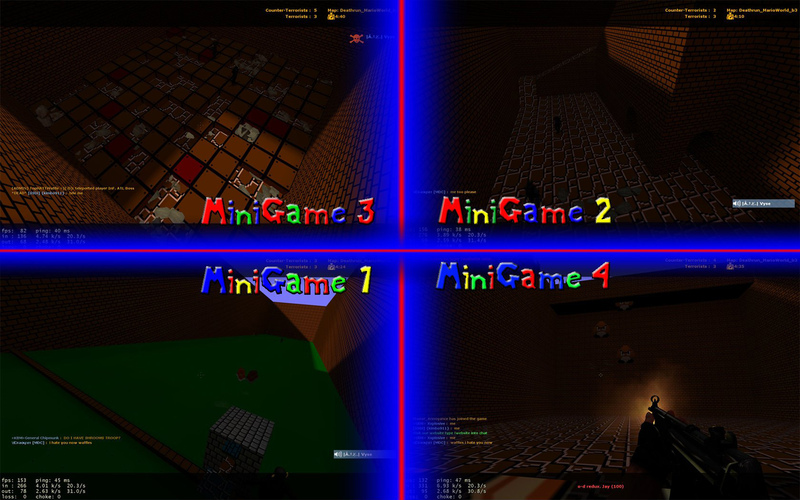 MiniGame 2 Rules: Knife the other player to death, PowerUps: Shroom – Gives you full life. FireFlower – Give you a glock with 20 shots. Star – Give you full health and and 3x normal speed, and a nice tune to listen to. MiniGame 3 Rules: The blocks will break to random every .7 seconds, don’t fall. 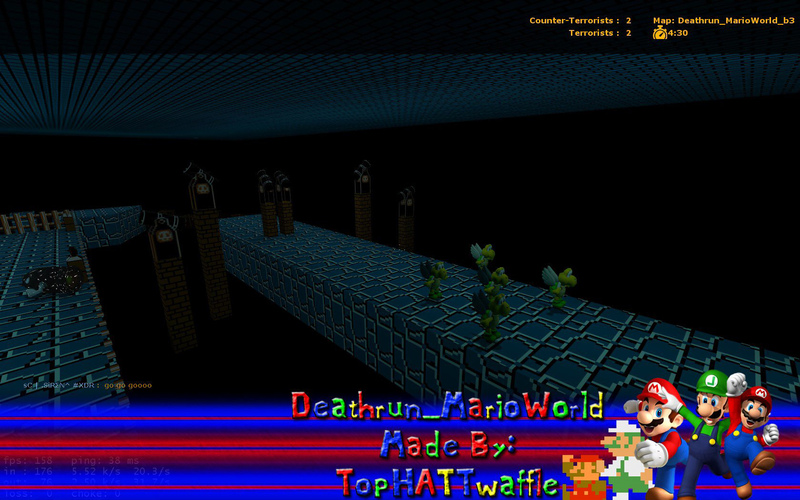 MiniGame 4 Rules: Shoot the falling goombas, first team to kill 15 goombas wins! and gets to kill the loosing team.